Photographing from vehicles, whether you are on a guided safari or self-drive safari, means potential damage to your photo gear. Therefore, protecting your gear from dust, heat, vibration or knocks is important as you don’t want some critical piece of equipment to fail while you are in the wilderness. Photographic equipment is expensive, difficult or impossible to repair when in a national park and your holiday memories depend on this gear so you must look after it! African game reserves are dusty places. Even if you drive with all your windows up the dust gets in through the vents or the doors. Dust can adversely affect your equipment so protecting your gear from dust is important. There are a few things you can do to limit the dust buildup. and we just throw a white towel over the equipment - this serves two purposes – it protects your gear from dust and protects it from the heat of the sun. If we see an animal it is quick to just throw off the towel and pick up the camera to shoot. Some people have suggested covering just the lens so that dust doesn’t get on it as this could show up in your photographs. 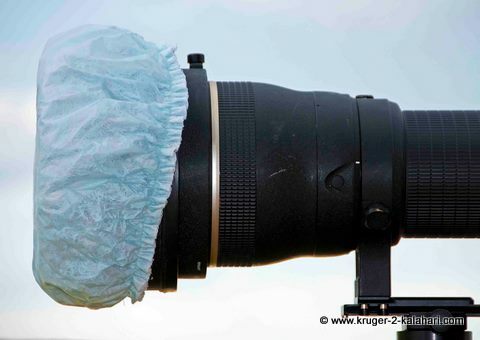 Keeping your lens cap on can be time-consuming when trying to get it off, and dust can still get in behind the cap so one solution is to use shower caps to cover the lens. Dust builds up on toweling and the toweling gives off lint so you don’t want to have this close to your lens element - with plastic you simply wipe the dust off. 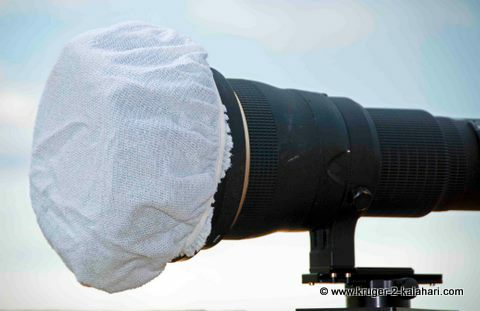 Another reason to have this thicker shower cap on your lens is for 'missiles'. Not the scud-type but for things like dung beetles! They are very hard and if they fly into your lens while you are driving at 40 or 50 kilometers per hour they could damage the glass. We used to have a vehicle with a sun roof and Jenny or I would often stand up scanning for game while driving and a dung beetle has flown into us and damaged our sunglasses or hurt our faces – imaging what your lens element would look like after that type of collision. You can also put UV filters on the smaller lenses to protect them from dust and knocks. The most effective item is a bulb-blower to get rid of dust. A can of compressed air and a paint brush (or Lens Pen) are also good to get to dust in hard to reach places on lenses and bodies. Keep in mind that the lens that is most susceptible to dust is the external focusing zoom lens as it acts as vacuum for dust. When cleaning a lens you should first blow with a blower then brush with the Lens Pen and wipe with a lint-free cloth (such as the Tetenal Mocrofibre Optic Cleaning Cloth) or the pad end of the Lens Pen otherwise you could be wiping or brushing grit across the glass. Protecting your Gear from Heat. Heat, like dust, can also damage photo equipment, especially black camera bodies and lenses that attract heat. As already mentioned, try to cover your equipment with a light-colored towel (white is best) to reflect the sun away from the items. When parking your vehicle at a picnic spot or camp leave the window open just a bit so that hot air can escape. The heat build-up, especially in summer (November – February) can be extreme. Don't leave the windows open too much as in summer it rains and snakes may enter the vehicle! Protecting your gear from Vibration is also something you should be aware of as vibration is another enemy of photo equipment. Many dirt roads are very bumpy and corrugated, especially in the Kgalagadi but also some in the Kruger, Pilanesberg and Etosha. When driving, items can move around, roll off seats, knock against each other and come loose. Ensure that all screws are tight, as constant vibration can loosen them, which happened to me with my panning ground pod – we have three of these items, each one mounted on our primary lenses and one of them loosened while driving but fortunately I heard it rattling and could tighten it before shooting. Items that are not being used should stay in a padded photo bag. What do you think of this lens...? No it's not the latest Nikon Tilt-Shift lens! 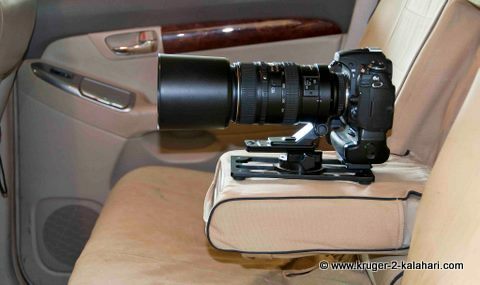 The one year I did not realize that my back-up Nikon D300 with Nikon 18-200mm VR lens had shifted over and was lying between the passenger seat and the door. After arriving at Skukuza Camp I parked at the bungalow and opened the door from the outside to unpack my equipment – you know what happened next don’t you – the camera and lens fell out onto the concrete. 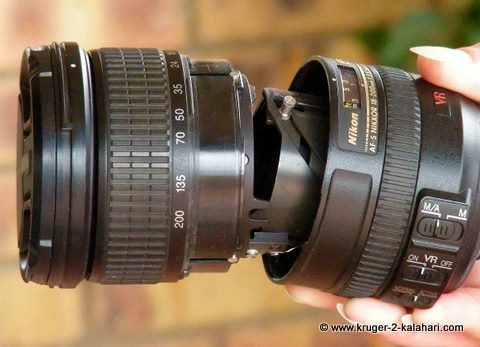 Fortunately it fell lens first – I say fortunately because I could replace the lens for R6000,00 whereas a new body would have cost much more. You'll notice in the first picture on this page that we now keep only two lenses on the front seat with the two back-ups in the pockets of an apron - we don't want a repeat performance of lenses falling out the car! 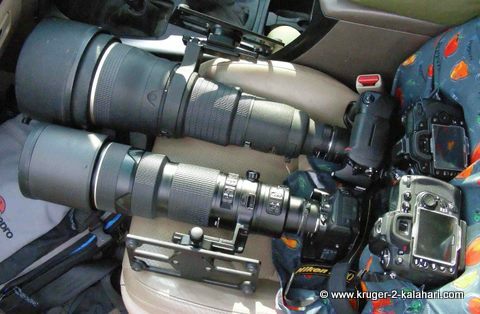 The two big lenses have panning feet so they cannot roll. So protecting your gear requires a few inexpensive items, such as a towel and / or shower cap, a blower brush and a Lens-pen or paint brush. Protecting you gear needs to be on your mind otherwise your holiday could be ruined. We are fortunate that when we did have gear problems (3 or 4 times) they occured on the last day of each holiday - thank God!